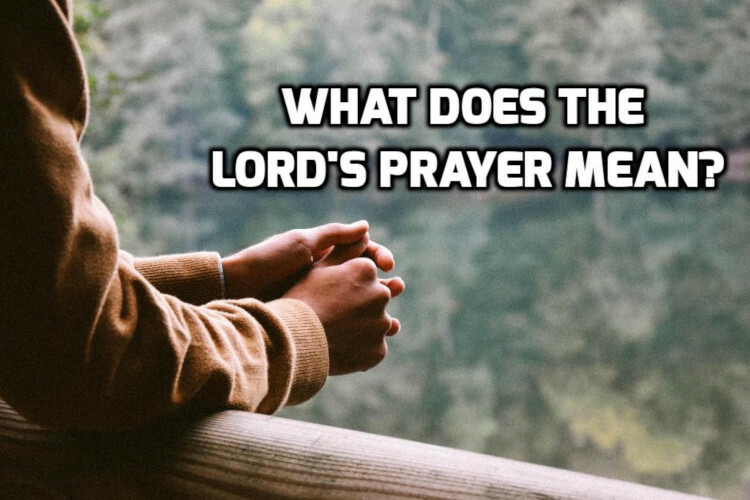 You are here: Home / Topics / Theology / The Lord’s Prayer: we say it but what does it mean? The more I study the Lord’s Prayer, the more I conclude the prayer makes one and only one request: that God would make us completely righteous once and for all. Why? In Jesus day rabbis would teach their disciples a prayer that encapsulated their main teaching. “As John taught his disciples” is likely a more specific request: Give us a prayer to help us remember your teaching as John gave his disciples such a prayer. If the disciples are asking for a rabbi’s prayer that embodies Jesus’ main teaching, then we should expect the Lord’s prayer to have one main point. Most likely Jesus spoke this prayer in Aramaic, so the first word is “Abba”, which is the word used to by children to address their earthly fathers. It was also used to address a respected person of rank. For example, a student could use it to address a respected teacher. It affirms both the respect of addressing a superior and a profound personal relationship between the speaker and the one addressed. The use of Aramaic in a prayer is significant because in Jesus day all public reading of the Scripture was only in Hebrew. Prayers, especially in public worship, were offered in Hebrew. An Aramaic-speaking Jew in the first century would be accustomed to reciting prayers in Hebrew, not Aramaic. To give them the prayer in Aramaic implies there is no sacred language by which we must speak to God. In endorsing Aramaic as a language for prayer Jesus opened the door for the New Testament to be written in Greek (not Hebrew) and translated into other languages. And if there is no sacred-language, then there is no sacred culture and the long term result is we have a global church most of whom have the Bible in their own language. In the Old Testament, when the verb “to make holy” is used in the passive, God is always the actor. We have a similar passive construction here: “may your name be made holy,” requesting that God to make His name holy. God’s name is holy but we fallen creatures have defiled it through disobedience. This is a request for God to demonstrate His holiness to all the earth, to fill the earth with His glory and vindicate His name, His people and His character. Essentially this is a request that God would establish His holy and righteous kingdom in our hearts and in our world. It calls for God’s holiness to come in the form of His kingdom and His will so that His righteous rule would be established on the earth just as it is in heaven. Sin on earth has disrupted His rule and broken His people and this is a petition for God to restore His holiness and remove sin and death. The word translated “daily” presents a problem because this particular word appears nowhere else in the Greek language. We discover the meaning of a word by examing how it is used. But if the word appears only once in the entire history of the language, we don’t have any way of knowing its meaning with certainty. Absent other evidence from Greek, we have to look at how early translators translated this word into other languages. That gives us two solutions to the mystery and each of the two solutions has two variations. Now what?? We take our best guess. My personal opinion (which is worth nothing) is bread of tomorrow (1b). Here’s what tips the scales for me. In the 19thcentury, two copies of an ancient Syriac version of the gospels were discovered. This Old Syriac translation is probably one of the oldest and earliest translations from the Greek into any language. Old Syriac and Aramaic are very closely related languages. Many of the words in one language are identical in the other language. This Syriac in this translation is the closest we’ve got to Aramaic — the language Jesus actually spoke. A literal translation of the Syriac is “Give us today the bread that doesn’t run out.” I think “give us today the bread that doesn’t run out” is a probably the metaphorical bread of life; the true bread from heaven that sustains our very soul—God’s holiness and righteousness — not the bread that sustains our bodies. Forgiveness is an integral part of saving faith. Part of saving faith is that God owes me nothing and I have done nothing that requires Him to forgive me. I am only forgiven because of His grace. It follows from that that I realize everyone else is in the same boat and there is no standard by which I can judge someone else that does not also condemn me. Hence seek forgiveness and I forgive others, longing for the day when God put all wrongs right. This last petition is fraught with difficulty as well. Do we have trials or temptations? What does it mean for God to “not lead us into trial?” There are two main ideas: one is causative and the other is permissive. The causative would be “do not cause us to go into temptation/trials”. The permissive would be “do not permit us to go into temptation/trials” — as in hold us back, keep our feet from running to the wrong path. Most scholars make the distinction that God tests us, but He does not tempt us. God tests His people in that He puts them in situations where they must choose to obey Him or not, and their willingness to trust and follow Him is displayed. God tested Abraham when He asked him to sacrifice Isaac. God tested David by giving him the opportunity to kill Saul and seize the throne. Those are external situations which God puts in a believers’ lives that stretches, tests and reveals the genuineness of their faith. But the inner desire, the inner pull we feel toward sin in the midst of temptation is the pull of our own sinful natures. We are not innocents entrapped by sins we would not otherwise commit. We are sinful people who left to ourselves would naturally rush into sin. Fleeing from and resisting the temptation is a gift from God. Each petition involves an act of God. The first three focus on God bringing His holiness to the whole world. The second three focus on God giving His holiness to believers. All of which adds up to one thing: asking God to make us and our world completely righteous once and for all. Source: For the best discussion and presentation of this information on the Lord’s Prayer, see Jesus Through Middle Easter Eyes by Kenneth E. Bailey.